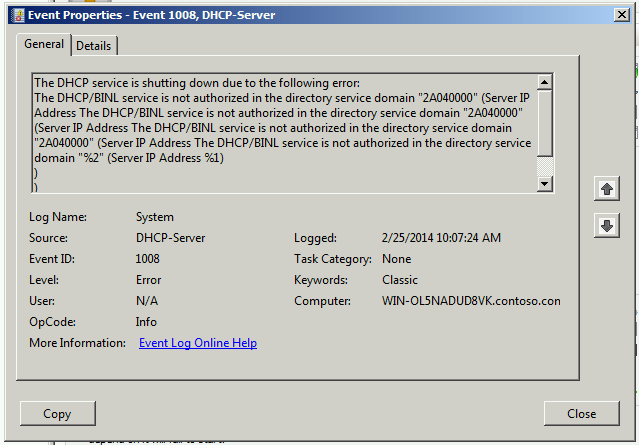 Extra Parts: Fixed: DHCP Server won't start with error "The DHCP/BINL service is not authorized in the directory service domain "2A040000" "
Fixed: DHCP Server won't start with error "The DHCP/BINL service is not authorized in the directory service domain "2A040000" "
In my Lab I've been having some trouble with the DHCP server. Today I finally got around to working on it. On my freshly installed DHCP server I got the following 3 events. It's worth mentioning here that my AD domain is contoso.com, NOT 2A040000. That error looks like an unhanded exception that is falling through to the wrong error message. The only explanation I could come up with for this was that my DHCP database was corrupt. I tried removing and reinstalling the DHCP Role, but that did not fix it. 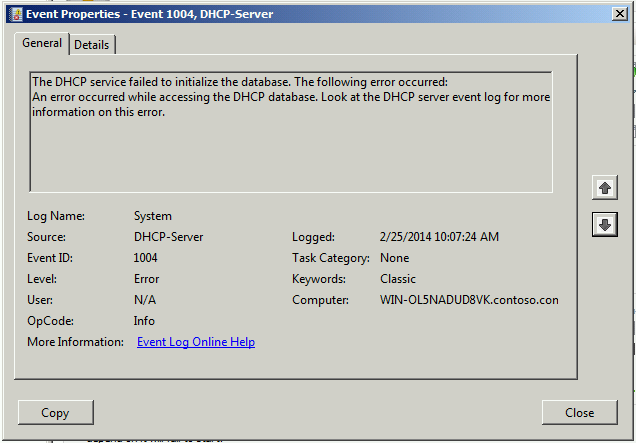 My solution was to delete the DHCP database and recreate it as follows. Cross-posted on the Microsoft forums here. Good grief! Can you believe it took me nearly an hour to locate this!? I knew what I wanted to do but couldn't remember what to call it or look for. Unauthorize *facepalm* Thanks!!!! I've been banging my head against a wall fighting with this exact issue. I kept deleting and re-adding the role, but the service refused to start. I removed the DHCP role, cleared out that folder and re-added the role without issue.